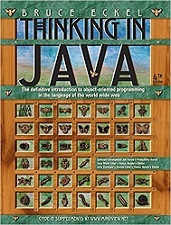 Perfect for migrating to Java from a fellow object-oriented language (such as C++), the 3rd edition of Thinking in Java continues the earlier version's thoughtful approach to learning Java inside and out, while also bringing it up to speed with some of the latest in Java 2 features. This massive tutorial covers many of the nooks and crannies of the language, which is of great value in the programming world. The most prominent feature of the book is its diligent and extremely thorough treatment of the Java language, with special attention to object design. (For instance, 10 pages of sample code show all of the available operators.) Some of the best thinking about objects is in this book, including when to use composition over inheritance. The esoteric details of Java in regard to defining classes are thoroughly laid out. (The material on interfaces, inner classes, and designing for reuse will please any expert.) Each section also has sample exercises that let you try out and expand your Java knowledge. Bruce Eckel is a computer programmer, author and consultant. His best known works are Thinking in Java and Thinking in C++, aimed at programmers wanting to learn the Java or C++ programming languages, particularly those with little experience of object-oriented programming. Eckel was a founding member of the ANSI/ISO C++ standard committee.